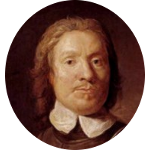 When the English Civil War resulted in the execution of King Charles I, Oliver Cromwell took over as the ruler of the new republican Commonwealth. He is said to have ruled with an iron fist and is remembered as one of the most controversial figures in British history. Oliver Cromwell was buried in Westminster Abbey, but after the Royalists returned to power in 1660 they had his corpse dug up, hung in chains, and beheaded. 2 The American Genealogist, New Haven, Connecticut: D. L. Jacobus (issues newer than 5 years not online), 1941, Vol. 18, p. 201, New England Historic Genealogical Society (Online Database). 3 Clay, John W., ed., Familiae Minorum Gentium, Vol. 2, London: The Harleian Society (1895), 437, Google Books (Digital Library). 4 Evans, Richard K., The Ancestry of Diana, Princess of Wales , Boston: New England Historic Genealogical Society (2007), 307. 5 Roberts, Gary Boyd, The Royal Descents of 600 Immigrants to the American Colonies or the United States , Baltimore: Genealogical Publishing Co. (2008), 49, 57, 270, 283, 292, 353, 464. 6 Wikipedia, "Oliver Cromwell", (accessed 04/24/2014).